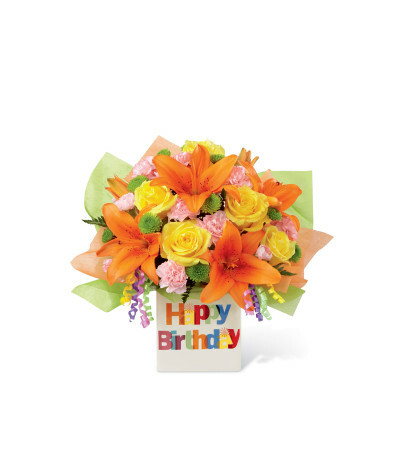 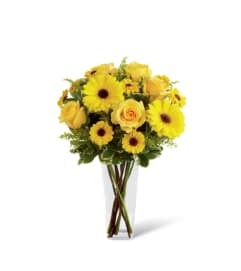 The FTD® Birthday Celebration™ Bouquet brings together roses and Asiatic Lilies to create a bright and cheerful way to send your happy birthday wishes! Yellow roses, orange Asiatic Lilies, pink mini carnations, green button poms and lush greens are brought together to create a vibrant, sunny flower arrangement. 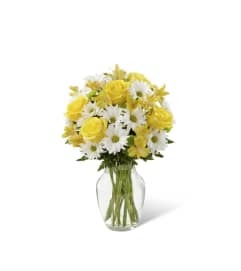 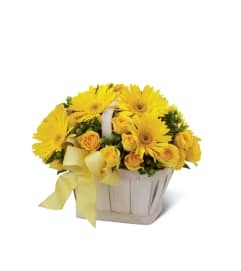 Presented in a ceramic designer vase with "Happy Birthday" displayed on the front in colorful lettering, this flower bouquet is beautifully accented with curling ribbon and designer floral wrap sheets to make this a birthday they won't soon forget.